Follow the steps below to clear programming, pair, and unpair your Cox remote to the receiver. Press and hold the Setup button on the Cox remote for three seconds, until the red LED on the remote turns green. Result: The LED blinks green twice and all devices are cleared from the remote. Important: Each remote is programmed to a specific receiver. To control a different one, unpair the remote first, then pair to the chosen receiver. Batteries are installed in the remote. Your TV is on and set to the input for the Contour 2 receiver. Press the Contour (Menu) button. Result: The LED on the remote flashes. Follow the pairing instructions displayed on the TV and enter the three-digit code. Press the Contour (Menu) button again and repeat until the instructions display. Then, enter the three-digit code. The remote may attempt to pair with other compatible receivers within 50 feet. 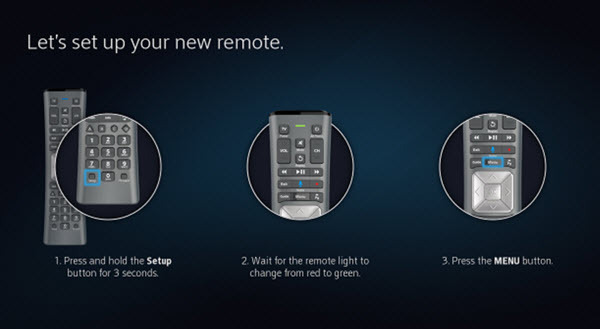 Each press of the Contour (Menu) button tells the remote to change receivers. Result: The receiver and remote are paired. When unpaired, voice control won’t work and the remote must be pointed directly at the front of the receiver. Press and hold the Setup button on the Cox remote for three seconds, until the red LED turns green. Result: The LED blinks green twice and the remote is no longer paired with the receiver.